The popularity of running and participation in sports across all ages has increased over the past few decades. While there are many health benefits to running and sports, injuries do occur. These injuries occur in active individuals of all ages and participation levels. There is a lot of information available, however only with expert assessment, is it possible to find the correct information for you. Out of this desire to prevent and treat injuries has evolved the Run & Sports Injury Prevention Clinic. The Run & Sports Injury Prevention Clinic is designed to give both the novice and professional runner and athlete valuable information about lower extremity biomechanical issues that can minimize injury while maximizing performance. Description of the evaluation stations used at this year’s clinic. We have made available some of the information that has been shared with participants of the Run & Sports Injury Prevention Clinic. Please select the information you would like to view and feel free to download. If you have any questions or would like to schedule a physical therapy evaluation please contact us at 610-518-9100. Advice on whether to talk to your doctor before you start an exercise program. The brochure for the upcoming 2017 Run-Sport Injury Prevention Clinic has been posted. Please see the Run Sport Clinic website for all the details. The event is scheduled for Saturday, March 4, 2017 from 9AM to Noon. The upcoming 2017 Run-Sport Injury Prevention Clinic will focus on injury prevention, nutrition, maximizing performance and has been updated for 2017. Please see the Run Sport Clinic website for all the details. The event is scheduled for Saturday, March 4, 2017 from 9AM to Noon. The 2016 Run-Sport Injury Prevention Clinic was updated to focus on injury prevention, nutrition, and maximizing performance. In Motion Physical Therapy is proud to stand behind and sponsor Team CMMD’s This Run Is Personal 5k and 1 mile walk. On November 5, the community where we are proud to provide healthcare services will come together for an event that raises money for families battling cancer. Team CMMD has already given $108,000 to fighters in our region this year and will assist more families from the proceeds of this run and walk. Please join us on Saturday November 5 at Downingtown West High School for something you can feel good getting behind. 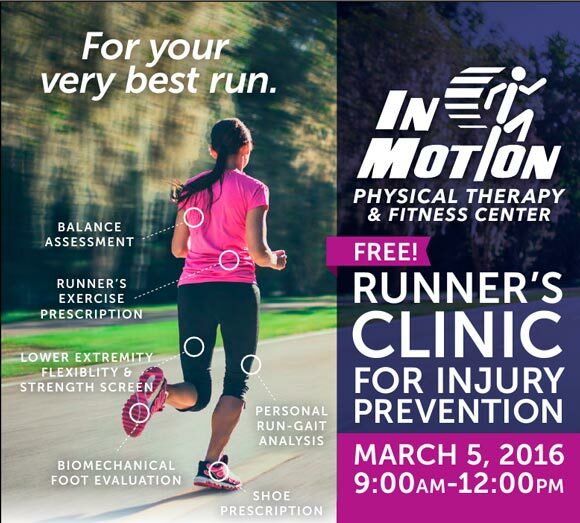 The Run & Sports Injury Prevention Clinic is designed to give both the novice and professional runner and athlete valuable information about lower extremity biomechanical issues that can minimize injury while maximizing performance. The name Marathon comes from the legend of Pheidippides, a Greek messenger. The legend states that he was sent from the battlefield of Marathon to Athens to announce that the Persians had been defeated in Battle in 490 BC. It is said that he ran the entire distance without stopping and burst into the assembly, exclaiming “we have wοn”. There is much debate about the historical accuracy of this legend. Devices available to today’s runners could have resolved this controversy. If you have not yet acquired an activity monitor, the shelves are stocked with many options to fit almost any budget and style preference. Pedometers, heart rate monitors, activity trackers and GPS watches are the main categories out there today. The Garmin GPS watches and the Fitbit devices combine several of these functions. At the high end, the Garmin GPS watch actually tracks your route while you exercise and collects data like heart rate, altitude, calories burnt, VO2 estimation (and more) so you can optimize your training. The sleeker Fitbit is fitness device that uses an accelerometer, which is more accurate than a basic pedometer, and can be worn on your wrist or clipped inconspicuously to clothing while tracking things like: number of steps walked, flights of stairs climbed, and how deeply you sleep at night. Many activity monitors on the market are able to sync to your cell phone or computer. The data is then available to review. Garmin products use a central app called “Garmin Connect” which keeps track of all your data, shows your progress, assists with training programs and offers opportunities to connect with thousands of other athletes. The Fitbit is compatible with over 20 apps so the user can chose which interface fits their training and fitness goals best. Whether running marathons or strolling in the mall is your activity of choice, activity monitors certainly help us keep track of our movement throughout the day and help us stay accountable to reach our fitness goals. Wearing an activity monitor can help you stay on track with your fitness or training goals, and may be just the motivation needed to help you achieve success. 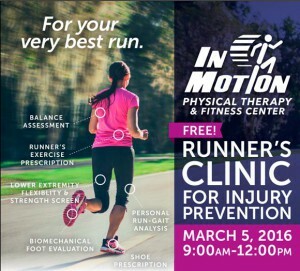 In March 2015, the In Motion Run Clinic will cover these types of devices in its focus on technology. If you haven’t exercised for some time or you have health concerns, you may want to talk to your doctor before starting a new exercise routine. The Mayo Clinic offers advice on When to check with your doctor first. The upcoming 2015 Run-Sport Injury Prevention Clinic will focus on injury prevention, nutrition, and maximizing performance and has been updated to cover some of the new tools available for health and fitness. Please see the Run Sport Clinic website for all the details. The event is scheduled for Saturday, March 14, 2015 from 9AM to Noon. This year’s event will focus on the use of technology in physical training. and how new devices – like those available from Garmin and Fitbit – can be integrated into your training routine.